Roy was raised by a single mother in upstate New York. As a child, he was surrounded by ministry and music. When he was only eleven Roy felt the Lord call him into the ministry. At fourteen, Roy began leading worship and even formed a couple of bands, but his heart was really about worship, not performance. At 21, Roy spent part of his time playing the guitar and piano with worship leaders such as Nick Coetzee and making frequent trips to the Brownsville Revival where world renown worship leader Lindell Cooley would lead. Roy was very taken in by the passion that Lindell had for the Lord in his worship. It really changed everything about the way Roy worshipped. “I always had a desire to lead people in worship,” shares Roy. “I love it when people get caught up in worship. There are times when we are worshipping that I sense His approval – and that’s what it’s about – doing what is pleasing to the Lord. It’s during these intimate times with the Lord that lives are being transformed.” Later, Roy moved from New York to Florida where he met his wife, Melanie and became the worship leader at a church in Niceville, Florida. Then in 2005, Roy and Melanie, stepped out by faith into full-time ministry and established Run with Fire Ministries. Together, Roy and Melanie moved out of their house and gave everything away because they knew that God had called them to preach revival. They began travelling up and down the East Coast from Maine to Florida with their two children and just an SUV to get them around. Many times it was tough for Roy and his family because they stayed in hotel after hotel and sometimes slept on the floors of people’s homes. There were times when they had no money and other times they were stranded in different cities. Some churches would not have Roy and Melanie because they were not known at that time. As a result, the Fields would take the money they had from the ministry, go to a city, rent a hall, spend several days there, and advertise in that area with flyers. In the meetings, Roy would lead worship for close to two hours. It was not on purpose, it just seemed that time went quickly as people were lost in worship. Roy or Melanie would preach each night, give altar calls and lay hands on the sick. The ministry began to grow and the favour of the Lord began to increase. More doors began to open. In 2008, Roy found himself in Lakeland, Florida where he ministered to a global audience of over 1 million viewers by way of the internet and television as well as over one hundred thousand people in attendance at the revival meetings. Roy and his family continue to travel the road globally to the nations in order to spread the gospel of Jesus through worship. To date, Run with Fire ministry has held revival meetings in over 27 nations and seen over 8,000 salvations. Roy accepted Jesus as his Savior when he was eight years old. He and his mom were attending a service at First Assembly of God Church in Binghamton, New York. 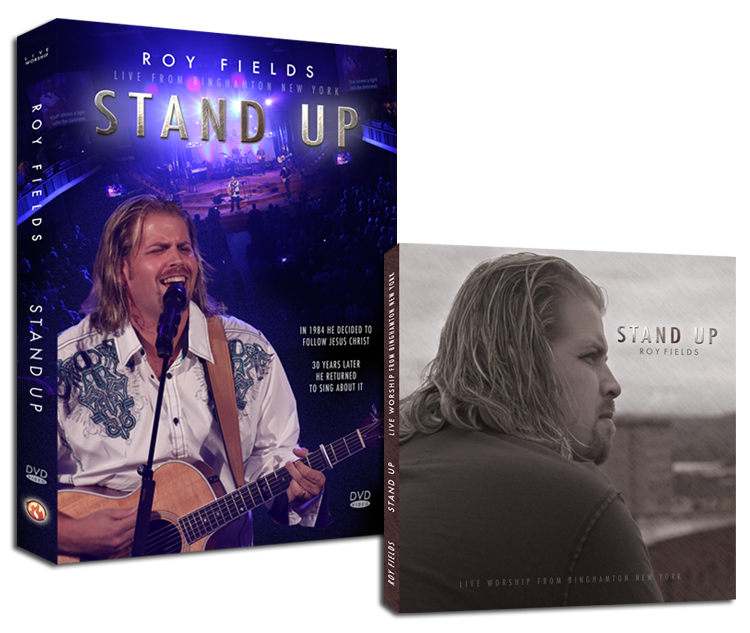 On October 4th of last year, Roy returned to the church to record his latest live worship album, “Stand Up.” “I believe in going back to my roots,” shares Roy. He wanted to show his gratitude to the church where his life was changed. For the recording, Roy asked some of the top Nashville musicians in the Christian music industry to play at the church. Close to 1,000 people travelled from around the world and from the local area to be at this event with people lining up hours earlier for the recording. At the end of the night, Roy gave an altar call and more than 100 people came forward to receive Jesus Christ as their Lord and Saviour. Roy was deeply moved when he noticed four of his cousins standing in line at the altar. This CD/DVD worship recording is scheduled to be released today.